Olive, olive-green to almost black above, with extensive irregular darker mottling, often with a bluish metallic sheen on the flanks. Whitish below, often with brown on the throat. Hind side of thighs dark brown. Fingers with strong basal webbing, toes nearly fully webbed. 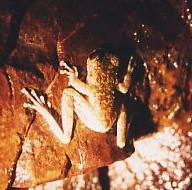 The average adult length of the Waterfall frog is 65 millimetres. Rainforest areas of north-eastern Qld. Found in and beside rocky streams in rainforest. When disturbed it enters waterfalls or swift-flowing water and hides under rocks or in crevices beneath the water.